Who said a Winter Wonderland needs snow? 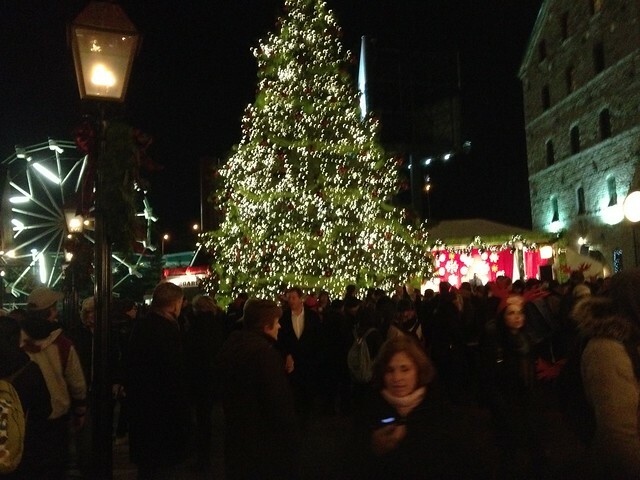 If the crowds at the Distillery District’s Toronto Christmas Market opening ceremonies are any indication, the spirit of Christmas prevails with or without the fluffy white stuff. This relatively new city tradition (inspired by the Christmas Markets in Germany and now in its second year) is a welcome addition to the holiday activities available to Torontonians in December. Every Christmas delight is covered, from a stand where you can purchase a Christmas tree for your home, to miniature cottages spread throughout the Distillery selling gifts and snacks, to a neighbourhood-wide liquor license (take your pick between beer or mulled wine), to the spectacular 45-foot Christmas tree (donated by Trees Ontario) and decorated with mint green sashes, shiny red ornaments and more than 12,000 reed switch component Christmas light bulbs. Sound like fun? Your kids will think so too–this is one Christmas event in Toronto for the whole family, and it is in continuous improvement in this regard. This event is so kid-friendly, it may come as a shock to your children! My advice would be to tell them you’re all going out to pick a Christmas tree, and let them discover the ferris wheel and the carousel for themselves. That’s Christmas magic. On top of the tremendous novelty of outdoor carnival rides in winter, your kids will love the free candy canes, hot chocolate, fudge, and other ‘sugar plums’ on offer; though they won’t enjoy the subsequent trip to a Toronto dentist as much, ’tis the seaon! Make this Christmas season a magical one for your kids by attending the FREE Toronto Christmas Market. For the occasion, one of the cobblestone streets in the Distillery has been renamed Santa’s Lane. Father Christmases of all cultures and customs will be present to tell their traditional stories and fill hearts with cheer, but to get to Santa’s house children must first find their way through a maze made out of small pine trees. – Santa will be in the Distillery on weekdays from 2 p.m.7 p.m. and on Saturday and Sunday from 10 a.m. until 7 p.m., with a reindeer petting zoo on location during weekend hours. -There will be daily reading of Grimm Brothers classics, and real-life characters Father Christmas and the Christmas Angel walking around. – Write the North Pole via Santa Mail! Canada Post is providing two letter boxes from which letters will be shipped express to Santa. Kids can write letters in Santa’s Workshop (indoors) as well as make crafts, stocking stuffers and play Christmas games with other children. With so much to see and do, you might want to make a whole day out of it, bringing lunch containers or opting to try some of the German street fare (like hot pretzels or schnitzel) available. – Finally, take photographs! Lenzr.com is sponsoring a Toronto Christmas Market photo contest, rewarding the best photograph taken of the market with $250. 2nd place will receive a $250 restaurant gift certificate, and third place will receive a $100 gift certificate courtesy of the Distillery District.